About A laid back Sunday morning in New York city. Thanx Jose ... your words are uplifting ones!! I love street scenes and this one is full of textures, tones and details, with nice composition and perspective. The "leave me alone, let me read my paper" composition is amazing. Great vision of things! just an excellent street shot. 7/7. What a great slice-of-life moment! Bravo!! 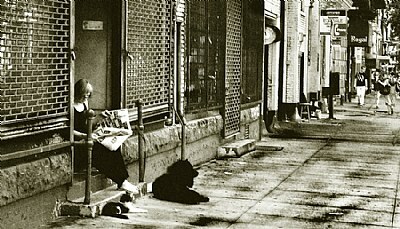 Excellent street shot, Deb, and the toning lends itself to that old time, lazy atmosphere of the reclining dog and cat with the woman reading the paper.